Sold! Congratulations to Jason and Corinne Cain of Aurora Australis Alpacas for their purchase of Maggie! 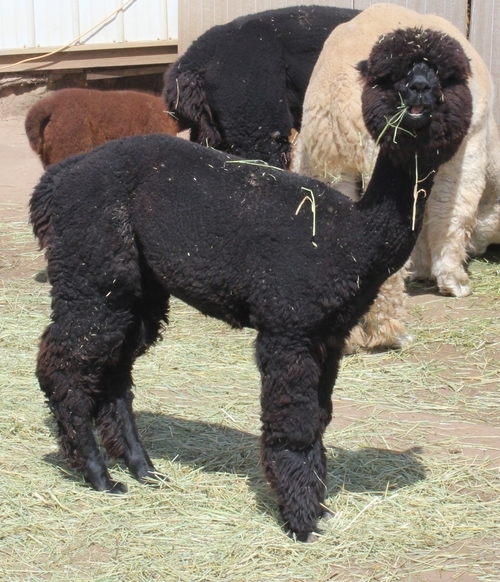 Maggie is sired by the multiple champion Magic's Copperfield -- son of multiple champion Blues Magic and the remarkable Almost Paradise Farms Beatriz -- who is also the dam of several other multiple champion alpacas, including the incomparable Bea-2 Bomber. Sold! 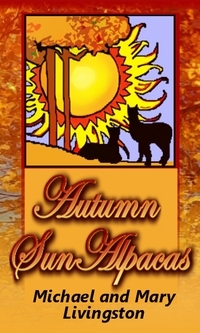 Congratulations to Jason and Corinne Cain of Aurora Australis Alpacas for their purchase of Cina! When this girl was born, her face was so beautiful to look and I found myself doing it so often that we named her Fascination! That is not a surprise when you consider the looks of her dam, our true black girl AutumnSun's Black Magic Girl (Maggie), and her sire, our true black Wolf Den's Dark Secret. Both parents are VERY well covered with a stylish full-fleeced 'teddy bear' head that always draws onlooker's eyes. Though we are moving more and more toward dark colors, especially blacks and greys, we cannot keep them all. With the fact that we have both her dam and sire, Cina is ready to move to another farm's production to bring her loaded black and grey lineage into use in a new breeding program. Let this farm be you, and call us now before someone else catches this deal.